Tanned, Rested, and Ready to Collapse. I don’t tan, actually. I burn and peel, then repeat, which is why I use SPF 50 or greater sunscreen when I plan to be outside for any extended activity, and usually use an SPF 20 aftershave in the morning. We’re just back from two weeks at the Delaware shore, my favorite part of the year. 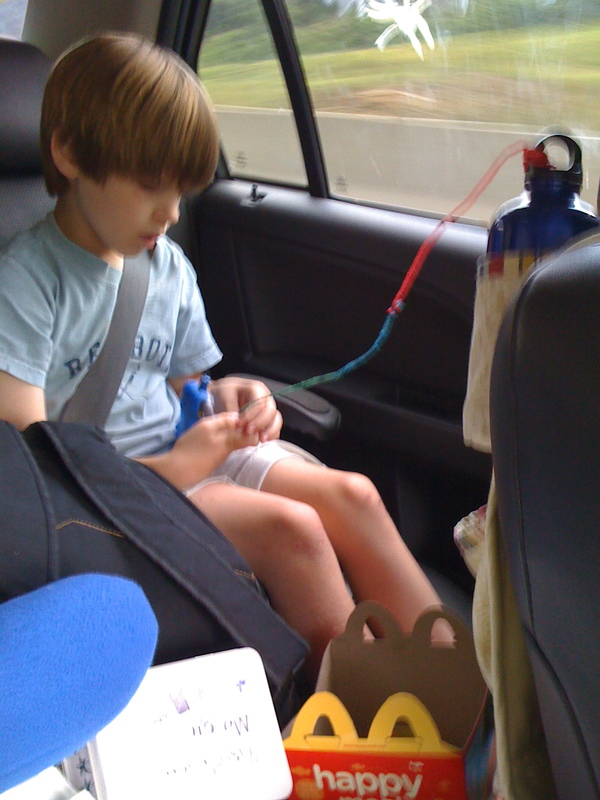 We drove, as usual, an 813-mile car trip each way, that is so much a part of the tradition that the kids almost never complain. We put them to the test on the trip home this year, though. We (mostly the Siren) installed new kitchen cabinets in the beach house we share with my aunt and uncle, and the last parts of that project interfered with our packing and cleaning enough that we couldn’t leave on Saturday as planned, and had to do the entire drive home on Sunday – 16.5 hours, including pit stops. This would have been bad enough if we didn’t stay up until 1am Saturday night packing and if we had gotten out before 10:30 Sunday morning because finishing up the cleaning and then loading the bikes and car top carrier took longer than expected. We got home at 2am, got to bed about 45 minutes later, and my cell phone rang at 8. I’ve been staring at the computer ever since, completely fried. I guess I’ll put some clothes on and start unloading the car. So after putting in pretty much full days of work Monday through Wednesday and a solid half day on Thursday, the important brief for work got filed Thursday night (thanks to an associate who was back at the office) and the vacation began in earnest. I ended up begging for – and getting – an extension on the chapter I’m writing for a treatise, which I will regret later but am very grateful for now. We had a full day at the beach yesterday, then a quick trip to Funland last night, all in all a pretty great day except for Junior refusing to eat at dinner. I gave him an ultimatum a couple of weeks ago about not getting special food at dinner, so now he has to eat the same dinner as the rest of us. Last night that didn’t go so well, and he essentially skipped dinner. Today, he ate much much better. Some of that was due to the 10.5 mile bike ride we did this afternoon, mostly on a wonderful gravel trail, between the towns of Rehoboth Beach and Lewes, through farmland, forest, and salt marsh on an old railroad right of way. The trail itself is pretty new, only completed in the last year or two, I think, and since the kids are only just now old enough to really enjoy it, the timing of its construction worked out well for us. 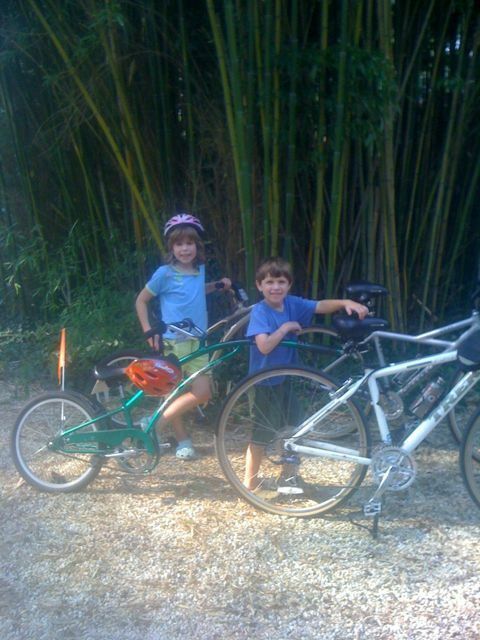 We had the kids on Trail-a-Bikes, which attach to an adult bike to create a tandem with a second seat suitable for a child. We rented one for Junior originally, but after a couple of shorter rides it was obvious that Unfocused Girl would burn out trying to keep up with us on a longer ride, so we rented one for her, too. They work pretty well, but keeping your balance when the kid in back wobbles from side to side takes some getting used to. It was a nice, long ride, and wore everybody out. I figure if we do a couple more of them in the next week, we might actually be a sporty family, not just crab-cake eating, beer-drinking pretenders (although I did buy matching Dogfish Head Beer hats for me and the kids at the brewpub the other night). Typing this out on my phone doing 75 on I-80 through eastern Ohio, the Siren driving. Time for our annual two weeks at the beach, thank the Flying Spaghetti Monster. It took us a little while to get out of Dodge, but we managed. 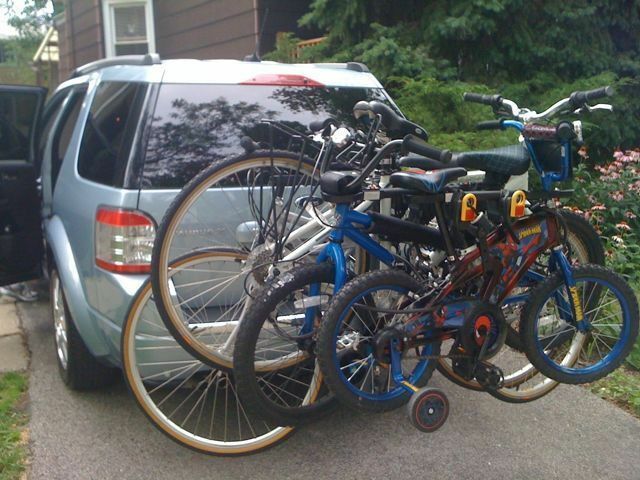 This year, the Siren’s new car enabled us to add a bike rack big enough to hold all of our bikes. We now look like one of those sporty families who are always off on those active vacations that sound much cooler than just hanging at the beach and eating too many crabcakes. I do like crabcakes, though, and Dogfish Head beer, which flows aplenty at the Dogfish Head Brewpub 5 minutes from our little shack. I think a brewery tour is in order this year. I brought more work than usual,, but I think it will all be done by next Friday, so the second week should be completely relaxed. Meanwhile, there should still be plenty of time for hanging out on the beach, catching up with some old friends, and getting thrown to the mats by the kids – last summer we bought our own gym mats for taekwondo practice and turned the deck into our own private mini dojang. Summer Vacation Stats, Part 2. We sang that song a lot during our drive. Our Tae Kwon Do yellow belt test is over. I passed outright — it’s the third time I’ve earned my yellow belt in TKD in the last 15 years, so I would have had no excuse for failing. Our instructor wants Unfocused Girl to redo self defense technique number 3 in the first class of the next session; a lot of the white belt kids have to redo even more of the test, so that isn’t bad. She knows the technique; to the extent she flubbed it during the test, I think it was just a combination of nerves and a partner (a kid from a different class) who didn’t know what he was doing. She’ll nail it at the next class and get her yellow belt, too. I think this is the first time she’s really had to work hard over time to achieve something, and she did a great job. 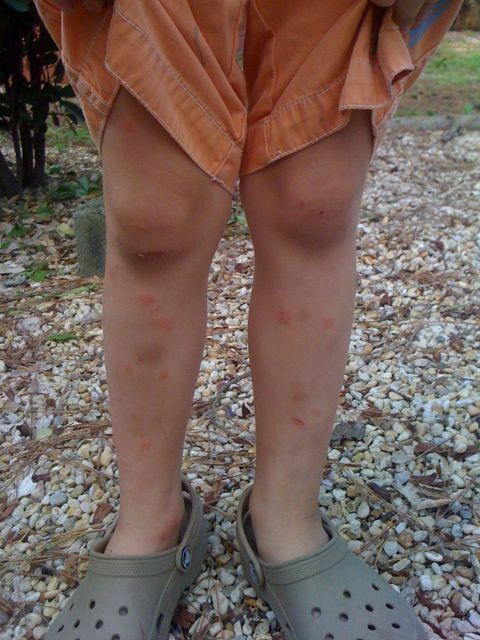 Number of years in a row the Atlantic Ocean has tried to take my son on our last day at the beach: 2. This year, I carried junior out into the water about up to my waist, past what had been, for most of the previous 11 days, past the break point. I misjudged it, and we were right where the waves curl over and start to crash down. I saw a big one coming, started back to the sand, and held Junior up to keep his head above water. Big mistake. When the wave came, I was already off balance, and got knocked over, and I lost my grip on Junior. It only took me a few seconds to find him in floating in the water and grab him, but it really shook me up. He handled it well, though, and wanted to go back in soon after. And yes, Unfocused Junior was able to play in the sand and go into the water, even with his cast. We used a terrific cast cover, and while it meant he couldn’t use his right hand for much, he still had a lot of beachy fun. It also forced us to try a few things in the area other than the beach, so that he wasn’t wearing the cover every day, which was neat. Miles run during vacation: 38, including five training runs of 6.1, 6.64, 5.23, 7.71, and 6.11 miles, respectively, and two 5K races (3.1 miles each). My goal here was to do well enough in one of the 5Ks to win an age group medal; these are small races, and it isn’t as though any of us are truly elite runners, so I thought I had a shot. In the first race (the first Sunday of our vacation, after we’d been there a week), last summer I was seventh in my age group; this year I came in fourth. There was a rainstorm during the race which slowed everybody down, so while my time was a little slower than last year’s, I don’t think it helped or hurt my relative showing. In the second race, the morning of the day we left the beach, I used some strategery. It was a combined 5K and 10K; last year, I ran the 10K. These races are part of a series; for the people who are at the beach all summer, there is one race each weekend for eleven weeks, and the people who run them all are ranked for the whole series. If you’re competing in the series, you have to run the 10K, and of the three guys in my age group who finished ahead of me in the first race, two of them were definitely competing in the series. I, of course, ran the 5K. My plan worked, and even though I came in one second slower than my 5K PR, I won my age group, the first time I’ve ever won any kind of athletic competition. Apparently, the secret is finding a race that the really fast people aren’t running. I didn’t get any better; I just arranged it so my competition was worse. I’m not complaining, and a win is a win and I feel pretty damn good about it, but I can’t pretend it’s because all of the sudden I got so much better. Summer Vacation Stats, Part 1. Unfocused Girl and I are testing for our yellow belts in Tae Kwon Do this morning, so I may have to split this post in two to get something up before we head out. Seems reasonable, since I’m covering a two-week vacation. Number of those days spent traveling or preparing for travel (packing, closing up the house, etc. ): 4. We drove to the beach this year, ignoring the conventional wisdom to leave early by leaving late and driving into the night. We weren’t comfortable trying to do the entire 813-mile route all in one day this year; next year, we will. The kids will be a little older and better able to handle it, and we’ll be more confident ourselves. We also used one of our own cars, Mrs. Unfocused’s Mercury Sable, instead of renting a minivan, which is what we did the last time we drove. It wasn’t as comfortable, but it was about $1000 cheaper just by saving the rental, not to mention the better gas mileage from the sedan. Number of dishwashers at our family beach house: 2 — Mrs. Unfocused and me. Number of days spent practicing Tae Kwon Do: almost all of them. We bought a couple of gym mats and hauled out our pads. Taking a two-week vacation right before our test could have really blown our chances of passing, but we worked pretty hard, especially Unfocused Girl. No guarantees, but I’m confident we’ll both do well. Breaking News! It’s Joe Biden! GREAT choice for veep! Okay, more about me. Where was I? Number of words of Meet the Larssons written: 1898. It’s not quite what I had planned, but I had a lot of things I wanted to do, and the vacation was about spending time with my family, not hiding in a cave by myself to write. Also, the beach house doesn’t have a cave. I’ve written more since. The running stats will have to wait for after the test. We got home from the beach Sunday night; overall, it was a great vacation. I’m trying (not terribly successfully) to get my head back into my job. I’ll post in detail over the weekend. We got here Sunday night after 13 hours of driving, split over Saturday and Sunday. The kids were great, even though we skipped renting a minivan and did the trip in Mrs. Unfocused’s Sable. We went to the beach with our friends the S family yesterday, and went hiking with them in the state park this afternoon. We got a little turned around, so our hike was about an hour longer than we planned, but everyone handled it well. I got in a six mile run this morning, mostly on the boardwalk, before the heat went from hot to brutal. I’m registered for a 5K here this weekend, so I’d better get used to the heat. So far I’ve spent less than an hour each day on my Blackberry or on the phone, which has been very, very pleasant. I wrote 723 words of Meet the Larssons yesterday, and 361 words tonight, so I feel like I’m getting the novel back on track. But the coolest thing is that this afternoon, the martial arts mats we ordered arrived. Unfocused Girl and I are testing for our yellow belts the Saturday after we get home, so I promised her we would practice while we’re here. We brought pads and plastic rebreakable boards with us from home, and ordered two 4-by-8 mats from a nearly manufacturer, and set them up on the screened-in porch in back. The Unfocused Do Jhang is open for business. Unfocused Girl has a wicked roundhouse kick, but for the test, she needs to break her board with a side kick, which she finds much harder to execute. We’ll practice kicks and forms and the other components of the test every day while we’re here. It’s a little different vacation than we usually have, but all in a good way.